System mailbox allows people who do not have access to the company mailbox addresses write to the company. You can create several system mailboxes. This may be, for example, a mailbox for support requests, for business proposals, for order requests, etc. Mailbox Label Name of the mailbox used in OroCRM to refer to it. Email Email address used to write to the mailbox. 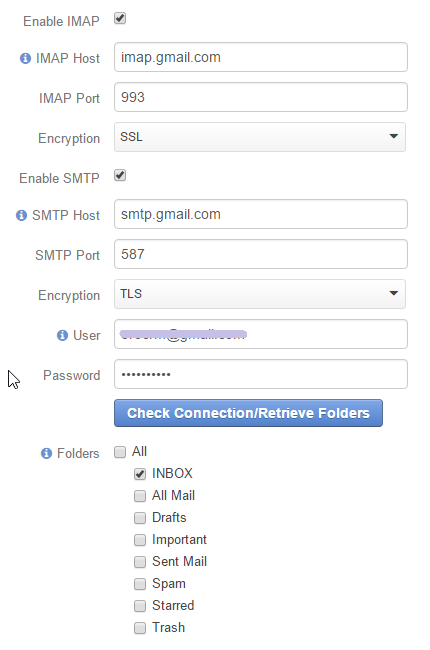 Let OroCRM know the details of IMAP (incoming mail) and/or SMTP (outgoing mail) connection for the mailbox, such as host, port, and encryption, and specify the login (user) and password used to access the mailbox. After successful connection, the list of available folders will be loaded. Check the Folders to be synchronized. In the example below, synchronization has been done for a .gmail mailbox. The INBOX folder will be synchronized. You can choose what actions will be performed with all the emails received in the mailbox. Do Nothing No actions will be performed. Letters will be saved in the mailbox. Convert To Lead Letters will be saved in the mailbox. Based on the first letter in the thread, a new Lead record will be created in OroCRM. Convert To Case Letters will be saved in the mailbox. Based on the first letter in the thread, a new Case record will be created in OroCRM. Define what OroCRM users will have access to the mailbox. You can select roles and/or specific users. All the users with defined roles + all the specifically defined users will have access to the mailbox. You can generate one or several auto-response rules upon which response emails will be generated and sent back to the senders of all the letters in the mailbox that meet predefined criteria. “Add Autoresponse Rule” form will appear. Status Only rules with the Active status will be applied. Name Choose the name to be used to refer to the rule in the system. Define the condition upon which the rule will be applied. In the first selector, choose the field, for which the condition is checked. In the second selector, choose the condition. Click the + or +Add button to add another condition for the rule. Click the x button to remove the condition All the conditions are summed up (AND operator). If you need some ORed conditions, just create a new Rule for each of them. Response Template Choose an Email template for autoresponse. All the templates with Entity Name value Email will be available in the selector. Choose the Custom if you want to create a new template. Email template Fill in the email subject and content. 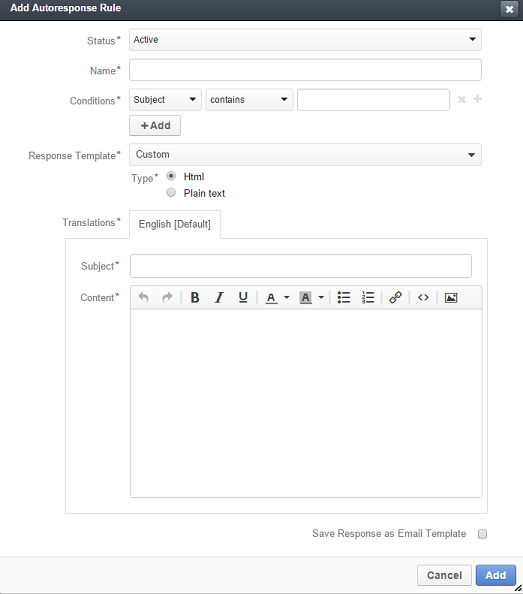 Save Response as Email Template Enable the check-box, and your email will be saved as an email template with entity name Email. Click Add button and the rule will be saved. 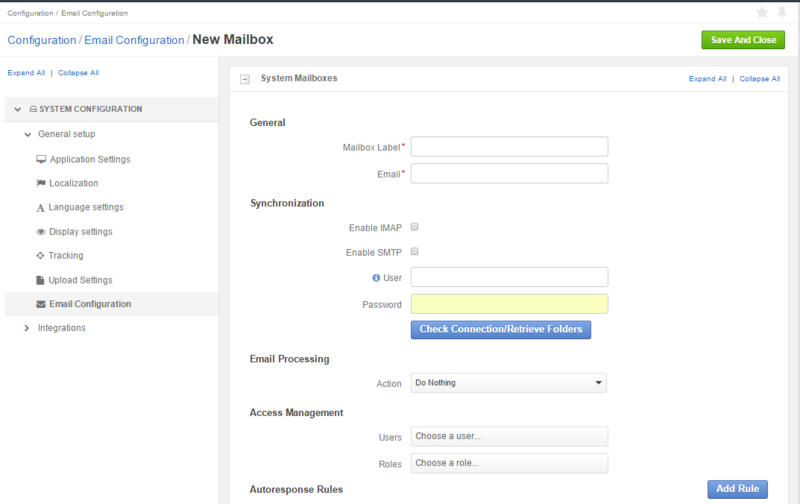 All the rules of a mailbox can be viewed and processed from the “Autoresponse Rules” grid in the corresponding section of the System Mailbox record page. Save the created mailbox with the button in the top right corner of the page. All the system mailboxes can be viewed and processed from the “System Mailboxes” grid in the corresponding section of the Email Configuration page.